Zanzana wrote about her dream for a Vegetable Garden here. There was a deadline for taking a decision, so she went to see the place. The association Angoli di Terra has its Vegetable Gardens in the Southern part of Milan, around 4 kms from Zanzana’s home. 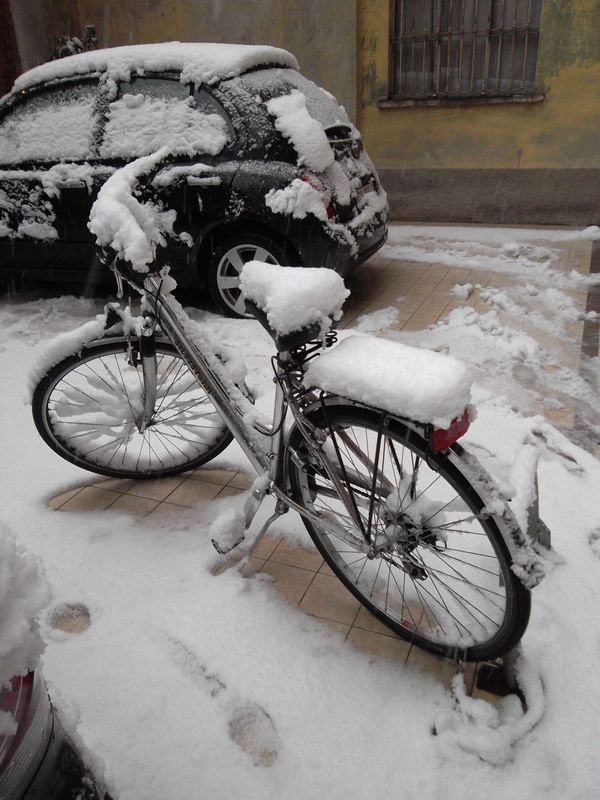 That day Milan was covered with snow, so it was not easy to reach the place by bicycle. She met at the entrance the person in charge of everything, Claudio, who, after introducing each other, asked her: “Who is going to dig?” Probably Zanzana’s aspect did not suggest him the idea of physical force, but she made him notice that she arrived there by bicycle after we got 20 cms snow the day before. He looked reassured, so Zanzana received all the indications in order to go and see the currently free slots. There were other people as well there, as the free slots were 4 in total. She walked down the small hill you can see in the picture until her candidate vegetable garden, n. 27, which you can admire here below. As you can see, it is quite big! She entered inside and checked the cupboard, that can be used for chairs or gardening tools. In fact she was not sure, as she liked also another slot, but eventually preferred this, a corner one (she followed also the advice of a gardener, in the age of her father more or less, who accompanied her on the way). She went back to the entrance, and this was really the most complicated moment: she did not know at all what to do. First she sent an mms with the vegetable garden picture to a friend and colleague who unexpectedly said one day at the Survival Compromise: “I want to work in a Vegetable Garden!” Zanzana has now a solution ready for her! 🙂 Of course the answer to the mms was something like: “This will be a vegetable garden, now it looks like a snowy field“. Then she discussed a little more with Claudio, explaining her fears and her lack of experience. He said this can quickly become a big passion, but it still requires committment, and he added Zanzana will not be able to go every weekeend to the beach, during summer (she is not in fact, but he could not know). He wisely suggested her to manage things step by step, and to try growing a few things first, avoiding to plan for a forest. He also mentioned it will be necessary to take clear agreements with friends and relatives for the work to do, as Zanzana mentioned the fact there might be someone helping her. Zanzana eventually phoned home before deciding, and she found a great support this time, so she said yes, and agreed to send the contract on the next Monday. Zanzana feels very happy when she thinks that she eventually decided to do that. We surely spend too much time talking and complaining, while it would be much better to try new ways, when we feel that we need it. Zanzana knows the work to do is a big point: she does not want to leave this responsibility on someone else (nobody would take it anyway), but she will for sure need help. She also knows quite some people who would have time to do that and who would feel better, committing some time to gardening and growing vegetables. She is planning to ask, but she is also preparing not to feel deceived, in case she receives a refusal. Getting her vegetable garden is for sure the biggest change, and probably biggest Christmas gift, Zanzana received this year: now beside the challenge to manage it, she hopes to make of it something useful for everybody! Zanzana recently received a really unexpected gift. Unarosaverde, a blogging friend, booked a ticket for Leonardo da Vinci’s Last Supper in Milan, but eventually could not come, neither her friends; Zanzana had the chance to go in her place, and enjoyed this occasion a lot. Zanzana is very grateful to unarosaverde, and really hopes to see her soon in Milan. Zanzana went to see the painting when she was in high school: the restoration was not complete yet, and the system was much less complicated, as you just had to wait for a couple of hours with 2000 Japanese, while now you have to book in advance, as groups of just 25 people are allowed to be inside for 15 minutes slots, not to damage the masterpiece. The Last Supper (1494-1498) is a mural painting, located in the refectory of the Convent of Santa Maria Delle Grazie, Milan. Leonardo realized it using the “a secco” technique, in order to provide much more details, but this caused the painting to be ruined already in the first years after the realization, not to say that also its history was very complicated. In any case, the last restoration was as much as possible effective and really allows you to admire the painting. Zanzana had a very peaceful feeling arriving at the church very early in the morning, as you can see from the pictures; it is not common to see Milan without so much traffic and confusion. When she entered the refectory, with the rest of the group, she took a seat and went through the painting details, as you can identify all the people represented: Leonardo wanted to fix the moment when Jesus revealed to the apostles that one of them was going to betray him, and you can see the reaction in their face expressions and gestures. After the visit she also appreciated a lot the church architecture, which is attributed to Donato Bramante, and had a walk in the cloister. Zanzana was very happy to bring with her on that day, at the Survival Compromise, the nice feelings and the pride you experience when you enjoy a masterpiece located in your country, and the fact that we have to learn a lot from other people’s generosity. 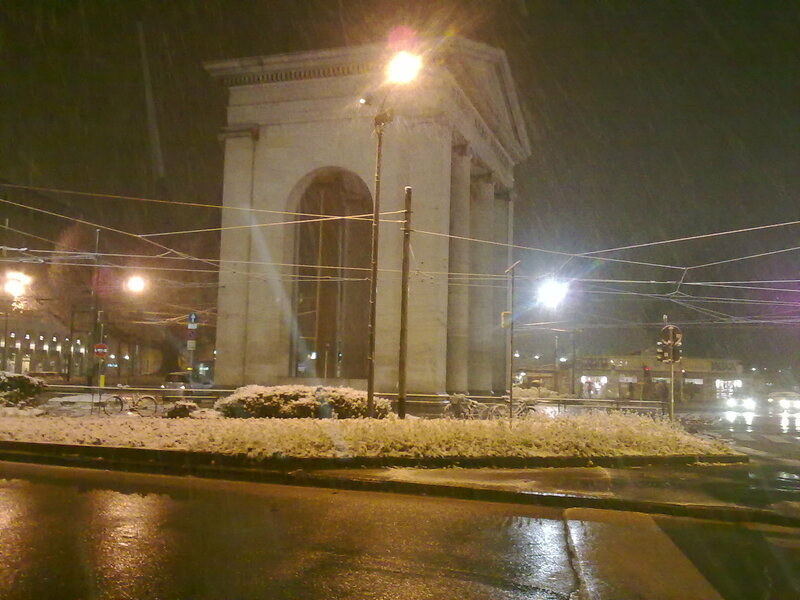 It seems we will have snow also this weekend in Milan. Zanzana is very happy about that and she is looking forward to it, so she is showing you here how her Iron Horse (her bycicle) can look after one night of snow. Enjoy! A Quick Stroll at Oh bej! Oh bej! Oh bej! Oh bej! 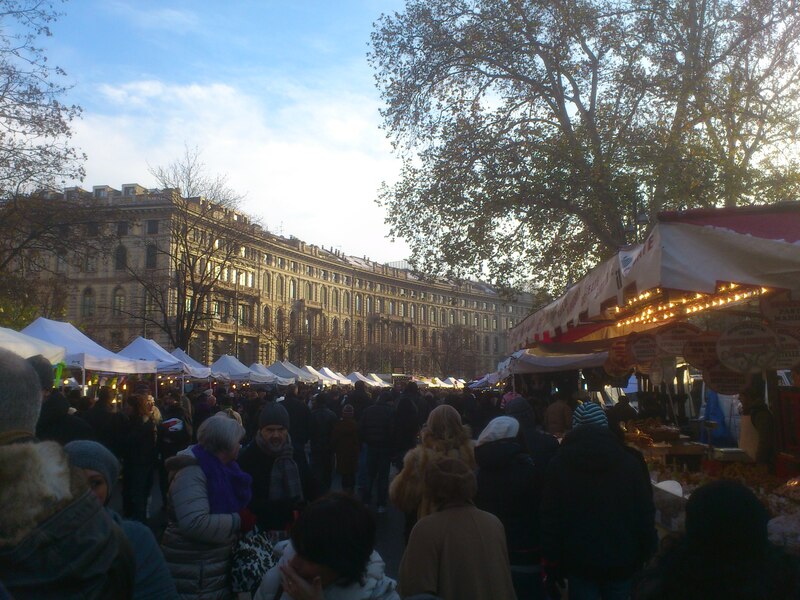 Fair is traditionally held in Milan on S. Ambrogio (7th of December) and on the following days; it is a sort of Christmas market, happening since 2006 around Sforza Castle, while it was held before close to S. Ambrogio church. It can be very very crowded, at the point that you can hardly walk. Zanzana went for a walk there also this year, after discovering that her husband wanted to go in order to eat a sandwich with grilled sausage, typical lunch during this kind of events. While celebrations devoted to Ambrose, in Milan, date back to the late 13th century, the actual Oh bej! Oh bej! 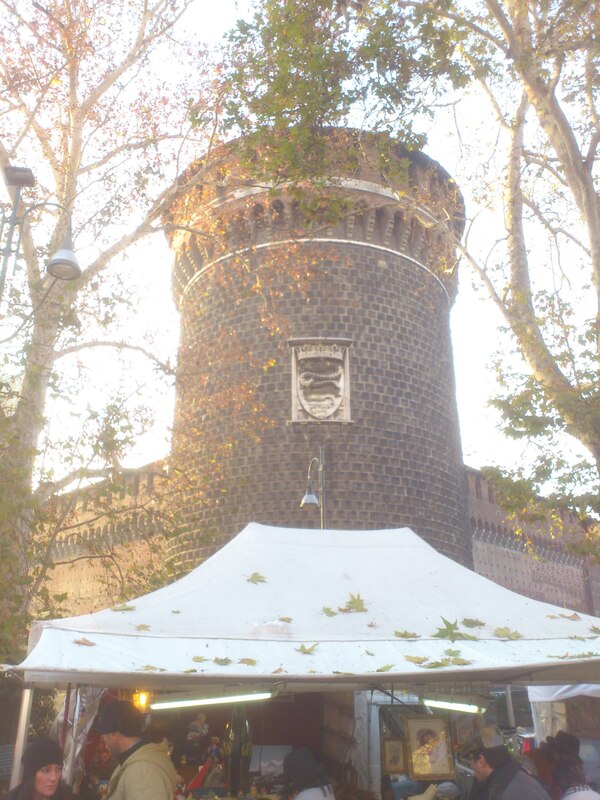 fair is said to have been established in 1510, on the occasion of Giannetto Castiglione, delegate of Pope Pius IV, visiting Milan on 7 December.According to the legend, Giannetto wanted to ingratiate himself with the Milanese, and thus entered the city carrying boxes full of sweets and toys for the Milanese children. A cheerful crowd followed Giannetto to the Basilica of Sant’Ambrogio, and thereafter the fair was established to commemorate that day. The name “Oh bej! Oh bej!” is supposedly a reference to the cheerful cries of the Milanese children receiving presents from Giannetto. 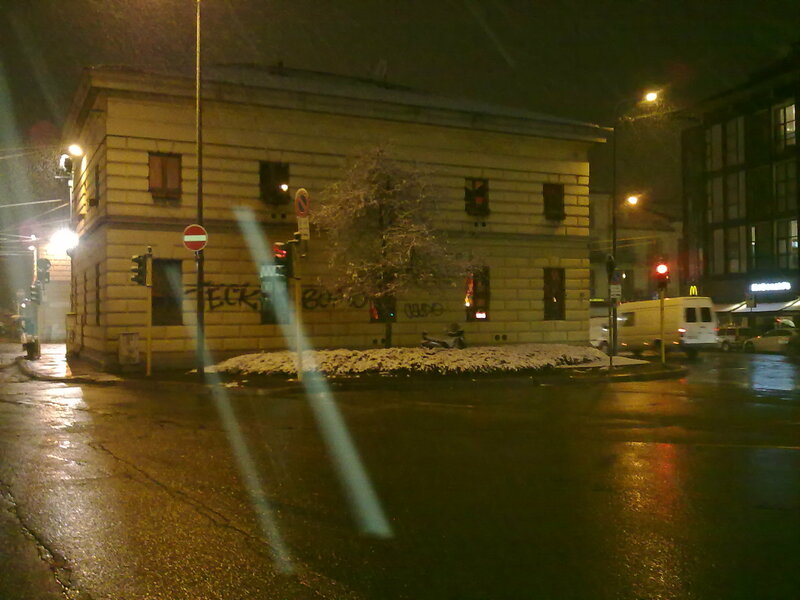 Today afternoon, the first snow arrived in Milan, perfectly on time. It seems some cold currents have reached us from Greenland. Zanzana went out immediately, because she likes a lot to walk when it snows. Zanzana really hopes it to stay for a long time.